The wreck of the SS America is located in the North Gap of Washington Harbor at Isle Royale National Park on Lake Superior. For GLSPS it represents our second but most extensive shipwreck preservation project. The original proposal for the experimental project was written in 1995 by Ken Merryman to request permission from the park service to repair damage to the forward crew's quarters caused by the collapse of a divider wall. The wall fell down sometime during the winter of 1993-1994 and allowed the overhead steam pipes to drop and several of the bunks to collapse. This turned the rooms into a tangled mess. The group that founded GLSPS had just finished the S.P. Ely project and believed that this preservation work was not only feasible but essential to preserving the integrity of their favorite dive sites. If they could gain permission and were successful in preserving a shipwreck in a national park, it would lend much needed credibility to the concept of preserving underwater historic sites. The initial response from park management was that permission would only be granted if professionals in the field believed it to be archeologically responsible to make the changes. This meant gaining consensus from the state archeologists of Michigan, Wisconsin, and Minnesota and the head of the NPS Submerged Cultural Resource Unit. Additionally since the SS America was on the National Register of Historic Places, approval also had to be gained from the NPS committee that controls National Register entities. The park management felt it would take another year to gain this approval. With the help of Liz Amberg Valencia and the support of Dave Cooper of Wisconsin, Scott Anfinson of Minnesota, John Halsey of Michigan, and Dan Lenihan of the SCRU team, the approval was gained within two months and in time for a post Labor Day project. The group had leaped the tall building, but was denied permission to do the project in 1995. In the words of Pete Armington, Isle Royale Chief Ranger, "The America Project has the potential to change the way we manage shipwrecks in the national park system and in the country." He felt, and understandably so, that when taking such an important first step there was a need to make it carefully and in full consideration of the ramifications. The petitioning group agreed in principal, but also realized they were fighting a battle against time to preserve a rapidly deteriorating shipwreck. Undeterred by this setback the group incorporated and formed the non-profit Great Lakes Shipwreck Preservation Society by the next spring. In 1996 with full acknowledgement and support of Isle Royale National Park the newly formed GLSPS carried out the first successful underwater restoration project on a shipwreck in a US national park and most probably in the world. 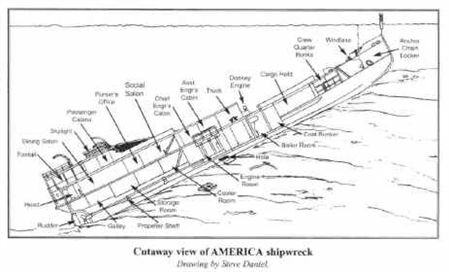 Today the SS America Project is an ongoing project which has documented, stabilized, and restored many rooms and portions of the shipwreck which would otherwise be piles of debris. Check the Projects Archive page for annual project updates and photos.